“In a nutshell, the RetroChallenge is a loosely disorganised gathering of RetroComputing enthusiasts who collectively do stuff with old computers for a month.
. . . so, here is my entry. 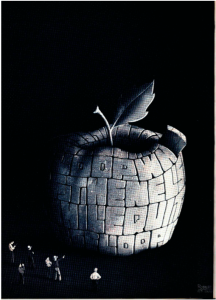 Back in ’83 I found in an issue of Nibble Magazine, a program called “Nibble Programmer” (click on the image to open the article PDF) that allowed you to write an ‘Applesoft’ program in a text editor, then parse that file to create an actual Applesoft program to run. What’s the big deal you ask? Well, the big deal is that you didn’t use line numbers (remember them?) by referencing Labels, as well as adding extra commands such as While/EndWhile, If/ElseIf/Else/EndIf that reinterpreted as unmodified Applesoft commands. Have a look at THREE-D PIC.txt for an S-Basic program listing I found on the recovered disk image. This is all very interesting (I hope), but what is the RetroChallange angle in all this? What I’m wanting to do is use the S-Basic 5.3 disk image that I recovered from one of my old and failing 5.25″ floppy disks and use this archival copy of S-Basic from back in ’83 (unmodified) to write a new and hopefully improved version of S-Basic. The first new function I want to add is long variable names as Applesoft just supports one or two character variable names, and while you could have used longer name, only the first two characters are recognised, so the to string variable names NA$ and NAME$ reference the same value. The other function I’d like to add is passing arguments to a subroutine. In Applesoft you can use ‘GOSUB 1000’ to jump to line 1000, execute some code, and the ‘RETURN’ statement returns the execution to the line following the GOSUB command. In S-Basic you would use ‘GOSUB LABEL’ and the code to be referenced would be preceded by ‘#LABEL’, but that is only a construct to get around the removal of line numbers. If time permits, I’d also like to provide limited scoping of variables so that any variables explicitly defined within the subroutine are local to the subroutine. Keep coming back as I post updates on how I’m going (or not). Let the coding begin!